More and more business–especially for small business–is being done on mobile devices. Smartphones are serving as credit card processing terminals and plenty more. 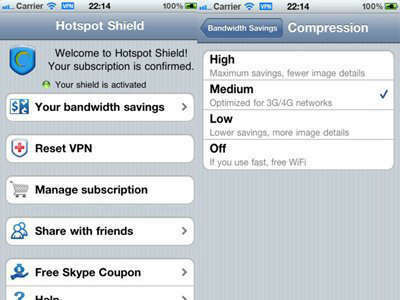 To protect those devices, AnchorFree is bringing their popular Hotspot Shield app from just iOS to Android. The Hotspot Shield app serves as something like a mobile VPN–Virtual Private Network–app, which in turn encrypts data sent from the device on which it’s running, and then does likewise for data sent into the device. On the off chance that that by itself wouldn’t be good enough, Hotspot Shield can also serve to reduce web page load times by pulling out the ads and images and such that might slow down loading speeds for users. The app started life as an iOS app, but made the jump to Android following the acquisition of a round of funding that brought in a whopping $52 million in funding. The reason for the delay, as AnchorFree’s CEO David Gorodyansky explained, was that building an Android app requires a lot more testing, likely due to the wide variety of devices that run the Android operating system. There is a fairly substantial difference between the iOS and Android versions, however, with the iOS version being free to try for seven days before requiring in-app purchases to continue using. The Android version, meanwhile, has a free and paid version in the works, with some of the features crippled on the free version brought to full activation when the paid version is brought into play. The price is somewhat unusual, in that this is a subscription app, charging either $1.99 a month or $19.99 for the year for Android, and iOS users paying a bit less. Protecting mobile devices is extremely important–a virus in the device that processes credit card transactions, for example, can wreak havoc on your records and your customers’ records alike. For those not convinced about the value of protecting devices, just look at Sony’s appearance at last year’s E3 show, in which they led off with a series of apologies over the hacking they–and their customers, whose personal information was at risk–had endured prior to the show. No one wants to lead off a trade show appearance with a public apology, so be ready to protect your mobile gear and hopefully save some headaches. But it’s not just protecting mobile devices that keeps a small business operating. Cloud-based telephony features like local numbers and click to call features can help keep your small business firing just as much as the mobile devices you depend on for operation. But either way, Hotspot Shield stands to do a fine job of keeping hardware protected against the worst the Internet can throw at it, whether for iOS or Android. This entry was posted in Android Apps, iOS Apps, Small Business, Virtual Office by Steve. Bookmark the permalink.